It was a fair question in reference to my (Tracy) bedtime prayer script. Every night I lay in bed next to my 5-year-old and thank God for how He’s grown her that day. Then I asked Him to help her listen to what He tells her to do tomorrow and give her the courage to obey. It’s a prayer you’ve likely said for your child too. Maybe like you, I never considered how I’d explain it practically to her. Such a simple explanation from such a small child, but we’ve seen the continued heart change over the last year to show fruit that her choice was sincere. If she heard His voice so clearly that day, then shouldn’t she remember it? I (Barbara) am realizing, even looking at my own life, that there are so many voices bantering for my attention and devotion each day, that often it’s hard not to be to distracted or to choose to follow something that is good but not the best. The questions from our Holy Spirit Summer Blog Club help me to evaluate those influences. Is it hard for you to apologize and admit you’re wrong? (if they are honest the answer will always be yes. You can admit that it’s often hard for you too.) Explain to your child “not wanting to admit fault is called your flesh or your pride in the Bible. It means we all want our own way just like Adam and Eve in the Garden of Eden. But God’s desire is for your pride to decrease and the humility of Christ to grow in its place. The Holy Spirit who lives in your heart will help you admit you’re wrong when you are and He will be pleased and happy when you do. Are you fighting for your own way and preferences? Do you sometimes like arguing because it’s fun even if you know you shouldn’t? Help your child understand that part of growing up is learning to listen to others, learning to consider what might be best for another person in the situation? The Holy Spirit wants to lead you to listen to others. Do you feel jealous sometimes when someone else has something you want or another person gets chosen or receives the prize? Likely your kids say, she ALWAYS gets to go first, I NEVER get to do that, he has MORE than me. Help your children understand that jealousy comes from a heart this is choosing self instead of God. God wants us to rejoice with those who rejoice. He wants us to be content with what we have. Why? Because He is the One who gives all good gifts. Is it hard for you to choose kindness toward a sibling or classmate who is hard to get along with? Maybe your child knows kindness is the right choice but has no idea how to be kind when they don’t feel like it. Explain this is what the Holy Spirit who lives in you wants to do for you. Teach your child how to pray for His help, saying simply, “Jesus, help me choose to be kind to my sister” when she knows the right thing to do but still finds it hard. You might explain too that retaliation, saying, I won’t be your friend either, only makes the situation worse. When you hear a parent’s or teacher’s correction, do you accept the consequences of your choices? Or do you try to defend yourself in a disrespectful way? If your first instinct is to prove you’re right, that is your flesh. It is not the Holy Spirit. The Spirit can help you listen too. Ask Him. Are you ungrateful and discontent? Discontent means always wanting more of something else instead of being happy with what you have. If so, you’re being led by your flesh. Ingratitude is never from the Holy Spirit. Remind your child that it’s okay if she’s not where she’d like to be yet. It’s very important that you admit to your child that, even as a parent, neither are you. Remind her that neither of you can get there on your own. Tell your child that you are both on a journey to know Jesus more and let Him lead us by His Holy Spirit. Tell your child you are praying for him or her and then pray aloud together, thanking the Holy Spirit who is at work in you that He is faithful to complete the work He has begun. The Holy Spirit is the greatest gift to believers, even young children who need their parents to encourage them to belief! What is the difference between your conscious and God’s voice? As you begin to listen for God’s voice, He may also release some gifts of His Spirit to you, such as prophecy, words of knowledge and words of wisdom. (See 1st Corinthians chapters 12 & 14) This can be a wonderful way to encourage others with timely words from the Lord that speak right to what God is doing in their lives. May the word of Christ dwell in you richly! Thanks for this! Praising God in all that I’ve been reading here…. I pray to be a woman of discernment, that Holy Spirit may teach me to be the best mum and person I can be! Amen! Thanks for this teaching. I’ll save and apply it as soon as my children get older. Remain blessed. Amen. Yes, Thank you Lord Jesus for everything you are. 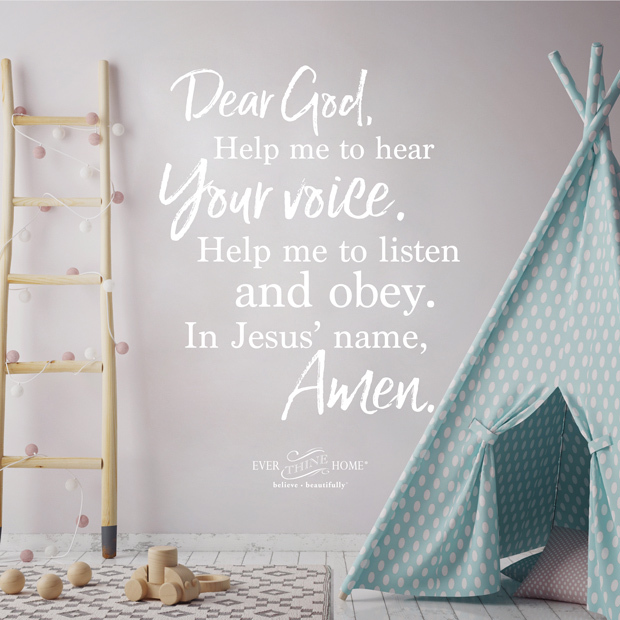 I ask You Holy Spirit to show me how to listen and Obey, I no longer want to seek things of my flesh, I do not want to be selfish and please teach me Lord to pray for my children from a distance for the times I cannot pray with them in person or over the phone. Thank You Jesus and Holy Spirit for your everlasting protection and word and blessings you have poured into my cup, I now see it is greatly overflowing Amen. Please teach me discernment as a woman and how to be a blessing to others in a correct way. Teach me and show me, speak to me Holy Spirit and guide me in the way I should go. Please here the truth behind my words and here my unspoken prayers Amen. Wonderful teaching. I am blessed as a parent. Thanks and God bless. Yes, Amen I agree. I enjoy some much this Family Life information. There is an overflow of abundance in the information Family Life provides. Thank You God. ← Do second marriages matter?